Video: “Last Days” for ISIS in Raqqa? Still facing the challenge in eastern Syria of the Islamic State — and possibly the US-backed, Kurds-led Syrian Democratic Forces, Russia has accused Washington of helping ISIS. Everyone sees that the US-led coalition is pretending to fight Islamic State, above all in Iraq, but continuing to allegedly fight Islamic State in Syria actively for some reason. The actions of the Pentagon and the coalition demand an explanation. Is their change of tack a desire to complicate as much as they can the Syrian army’s operation, backed by the Russian air force, to take back Syrian territory to the east of the Euphrates [River]? Or is it an artful move to drive Islamic State terrorists out of Iraq by forcing them into Syria and into the path of the Russian air force’s pinpoint bombing? Speaking during a visit to Sochi in southern Russia to discuss economic assistance (see below), the Assad regime’s Foreign Minister Walid al-Moallem echoed the Russian line, saying the Pentagon is using the ISIS to “cover up its destruction campaign in Syria”. Russian Difficulties in the East? The pro-Assad offensive moved into Deir ez-Province at the start of September and advanced rapidly to the east, breaking a three-year ISIS siege on both Deir ez-Zor city and the nearby military airport. However, after moving into the western section of the city, the forces were hit by an ISIS counter-attack which inflicted heavy casualties and reclaimed territory to the south along the Euphrates. The Islamic State even returned to eastern Homs Province — including the town of Qaryatayn, 300 km (186 miles) from Deir ez-Zor. ISIS showed video of two captives whom it claimed were Russian troops, and reports are circulating that up to a dozen Russians were slain. The pro-Assad forces have retaken the area to the south of Deir ez-Zor; however, they have still been unable to break into the city of Mayadin on the Iraq border. ISIS also still controls Qaryatayn and continues to threaten the town of Sukhna. The Assad regime’s military and its foreign allies are also wary of the Syrian Democratic Forces, led by the Kurdish militia YPG, who also entered Deir ez-Zor Province last month and are to the north and east of Deir ez-Zor city. Russia has tested the SDF by striking its units once — twice, according to the Kurdish-led force — and by constructing pontoon bridges for the pro-Assad offensive to cross to the eastern bank of the Euphrates. Regime Assistance for ISIS in Eastern Hama? 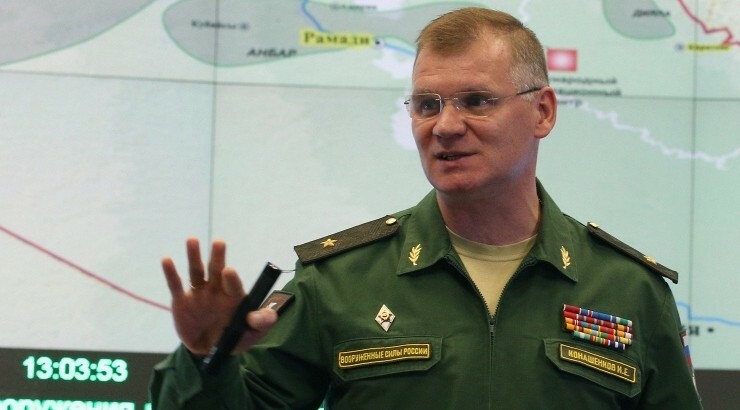 The Russian statement came a day after the Assad regime was accused of enabling the Islamic State to attack the jihadist bloc Hayat Tahrar al-Sham in eastern Hama Province. ISIS claimed that it captured 12 villages, although some were quickly retaken by HTS. Pro-opposition activists noted that Islamic State fighters crossed at least 30 km (19 miles) of regime-controlled territory to reach the HTS frontline. The regime military had said last week that it cleared ISIS from its last pocket in the area. A Russian Su-24 jet has crashed at Hmeimim airbase in western Syria, killing both crew. The Defense Ministry said on Tuesday that the warplane “skidded off the runway and crashed while accelerating to take off for a combat task”. It pointed to a “technical malfunction”. Footage of Kurdish-led Syrian Democratic Forces evacuating civilians from the battle in Raqqa against ISIS. The SDF troops declared that the Islamic State is in its “last days” in the city it has held since late 2013. More than three months after the SDF entered the city, there are clashes in northern and central districts, including the National Hospital, the adjacent a-Naeem intersection and a nearby sports stadium. Ahmed said up to 1,000 ISIS fighters are encircled. A regime delegation led by Foreign Minister Walid al-Moallem has sought economic assistance in a meeting in Sochi in southern Russia. Moallem signed a protocol with Russian Deputy Prime Minister Dmitry Rogozin, but there were no substantive announcements as the Assad regime looks for aid with reconstruction and continued propping-up of its crippled economy. The Foreign Minister asserted that he is “not worried about the speed of implementing what we have agreed on”, but then prodded Moscow by saying that the faster the Russian companies meet their obligations, the faster the Syrian economy recovers “and the more assured you will be about your investments in the Syrian economy being remunerative”. The Russian Deputy Prime Minister described the protocol as deep, serious and built on solid basis after which several agreements will be implemented in order to help Syria overcome a very difficult stage. With Syria having lost more than 75% of GDP during the 79-month conflict, including up to 95% of oil and gas production, the regime is heavily dependent upon support from Russia and Iran to maintain a semblance of economic activity. Rebels in northwest Syria have handed control of a major border crossing to the Syrian opposition government. Aba said Jabha Shaimy has joined a “national army” under the interim government’s defense ministry. Bab Salama is in northern Aleppo Province, where the Free Syrian Army and Turkish forces cleared out the Islamic State last year. This summer the jihadist bloc Hayat Tahrir al-Sham forced the rebel faction Ahrar al-Sham from another key crossing, Bab al-Hawa in Idlib Province, with an ostensible handover to civilian control.